Cannabis oil is a natural medication which has no negative side effects. Like all medications, it does have some side effects, but none which compromise the health of the patient. Side effects can be defined as “a secondary, typically undesirable effect of a drug or medical treatment” according to the Google dictionary. When you take cannabis oil, you will certainly not experience anything undesirable – you may feel a bit drowsy, your mouth may be a bit drier, your blood pressure may drop a bit and you will feel intensively calm. Are these effects UNdesirable? And we never refer to cannabis oil as a drug – it is a natural THERAPY that we promote as an alternative method to healing. We know that cannabis oil impacts mind, body and spirit and can therefore become the panacea for holistic health. Cannabis oil has no negative side effects and is now becoming an acceptable medical treatment. It is extracted directly from the cannabis flowers and contains hundreds of chemical compounds called cannabinoids, and terpenes. The two most commonly used cannabinoids for medical cannabis products are cannabidiol (CBD) and tetrahydrocannabinol (THC) which are potent healing agents. THC does have side effects: euphoria, paranoia and anxiety, dry mouth and eyes, lethargy, hunger and short term memory loss. CBD, on the other hand, is non-psychotic and has no real side effects, except for those few we mentioned in our introduction. The best part about taking THC is that you can blend it with CBD and it then loses its ability to make you high and paranoid. Instead, you feel no side effects, and you get the benefits of being healed. We recommend a CBD : THC blend where the ratio of CBD to THC is higher. CBD and THC interact with the body’s endocannabinoid system (ECS) to ensure that all the inner systems retain their homeostasis. 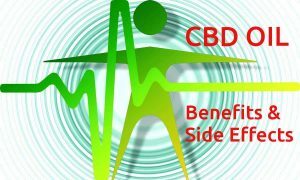 Ill-health often starts with inflammation, a sign of disease, and CBD is a natural anti-inflammatory. It is also an antioxidant, detoxes the body and creates a sense of calm. It is therefore a great treatment for stress, anxiety and depression. 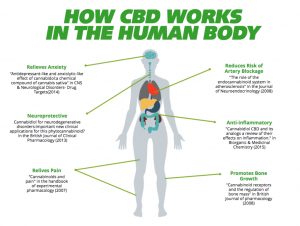 CBD can also treat pain, muscle spasms, uncontrolled shaking or muscle movements, metabolism and appetite issues, headaches and migraines, insomnia and nausea. Cannabis oil has no negative side effects worth mentioning. 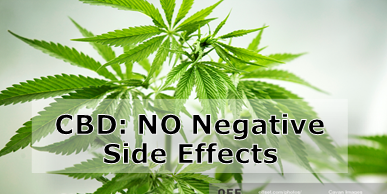 The positive side effects are numerous and really worth mentioning.Cannabinoids bind to cells with help from two groups of molecules called receptors. CB1 receptors occur mostly in the brain, where new memories are created and where pain is perceived. CB2 receptors are found mainly in the immune system which stimulates inflammation if there is any disease of the body. CBD binds to the CB2 receptors while THC clings to the CB1 receptors. The ECS helps maintain homeostasis in the body and manages several diseases. This explains why taking cannabinoids helps to control disease as they cooperate with the endocannabinoid system, mimicking different endocannabinoids. Have we convinced you yet that cannabis oil is side effect free? We believe in the positive impacts of this natural therapy and hope that you will think twice about taking some pharmaceutical drugs which do have negative side effects.